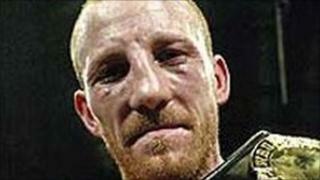 Former world boxing champion Eamonn Magee has appeared in court accused of stealing two bottles of champagne. Mr Magee, 39, is alleged to have stolen the bottles from an Asda store on Shore Road in Belfast. The ex-WBU welterweight title holder, from Rashee Drive, Ballyclare, County Antrim, denies the charge. Appearing before Belfast Magistrates' Court, he pleaded not guilty to stealing the champagne, valued at £55.80, in October 2008. Magee, known as The Terminator during a professional career which included 33 fights, captured the WBU belt following earlier Commonwealth success. He was the first boxer to floor fellow ex-world champion Ricky Hatton, even though he went on to lose that bout on a split decision. Since his retirement from the ring four years ago he has worked as a trainer at the famous Breen's Gym in Belfast. He will contest the shoplifting allegations against him at a hearing which has yet to be arranged.